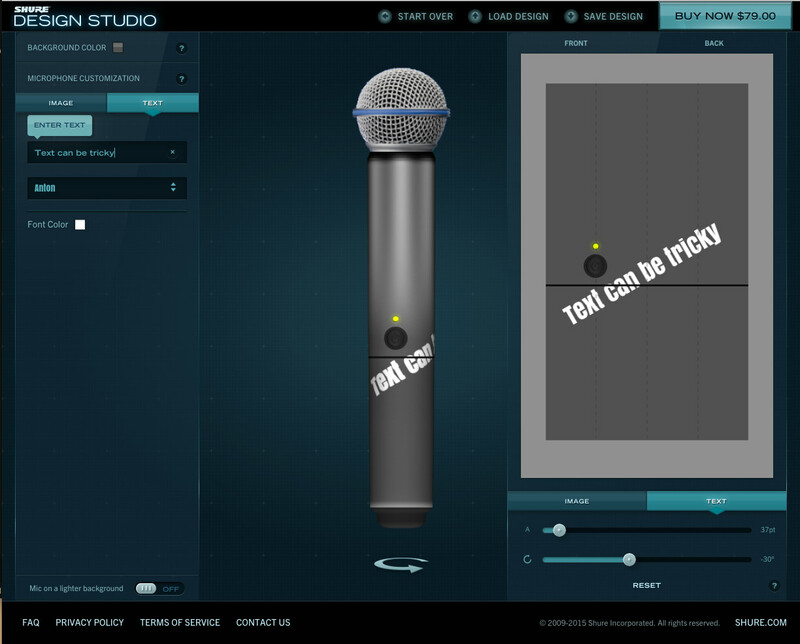 Recently we built a tool for designing microphones in the browser. When a user is ready to make a purchase, the server generates a super high-resolution version of their design for checkout. This ensures that microphones look fantastic when they reach a customer's doorstep. It also introduces a couple of challenges when synchronizing text placement with the browser. Specifically we noticed inconsistencies in positioning between ImageMagick and HTML5 canvas. In this post I'll walk through our approach for solving this problem and some of the interesting points along the way. Now what about ImageMagick? To measure text we first use convert to render the given text with the proper typeface and size. Then we measure the dimensions of the produced graphic to determine the offset required to rotate around the center (just like in canvas!). Many thanks to Mike Ackerman for the brilliant thinking here. This code is also available as a gist. This will produce two images. The first is the direct output of painting text. The second is the final result of applying this text with transformations on a 400x400 pixel canvas. There are probably other methods to do this, however I really like how similar the operations are between the server and the client. When working through this problem, having mirroring approaches significantly reduced the cognitive load required to visualize the problem. This was particularly useful when many additional transformations were applied, making revisions to the process an easier task.